ATLAS ELEKTRONIK contracts Magellan Aerospace for development and qualification of the SeaSpider underwater rocket propulsion and warhead sections. Sea trials in the Baltic Sea for the torpedo defence study are conducted on a German Bundeswehr Technical Center for ships and naval weapons, maritime technology and research (WTD 71) multipurpose vessel. These comprise the full functional chain with Torpedo Detection, Classification and Localisation (TDCL) sonar and the third generation SeaSpider prototype with its above water launcher. At the WTD71 test range both a Mk37 torpedo derived AUV and torpedoes of the DM2A3 type serve as the threats which are detected and localised with passive and active TDCL and the attendant data is used to cue the SeaSpider launch. SeaSpider acquires the threats and homes in into closest point of approach (CPA). Successful “intercept” equivalent CPA is verified by acoustic and optical means. 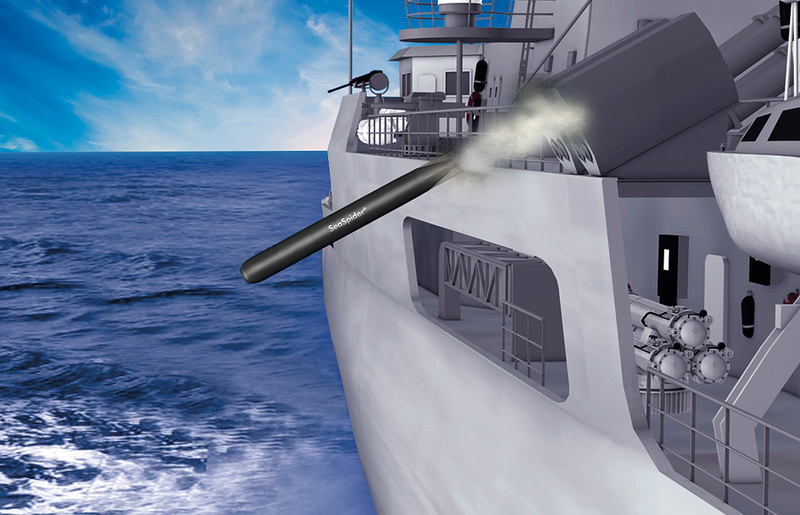 ATLAS ELEKTRONIK receives approval to company fund serial product development of the SeaSpider ATT and the ATLAS ELEKTRONIK surface ship torpedo defence suite. Co-development of the SeaSpider explosive section in Canada is being prepared by ATLAS ELEKTRONIK and Canadian enterprises. The sea-trials of the torpedo defence study progress with the SeaSpider prototype graduating to above water launch in preparation for at-sea trials series starting in autumn 2016. The third generation SeaSpider prototype is developed and produced for the torpedo defence study. The improvements comprise the sonar processing, inertial navigation system and control & guidance electronics. SeaSpider is the centerpiece of a bi-national torpedo defence study program of Germany and the Netherlands. Further sea trials of the SeaSpider prototype in the Baltic Sea. The rocket propelled SeaSpider prototype performs close loop homing into closest point of approach on a free running heavyweight torpedo in the challenging shallow water environment of the Baltic Sea. This demonstration of the relevant capability in a relevant environment with the integrated prototype constitutes proof Technological Readiness Level 6 (TRL 6) is attained. Sea trials with the SeaSpider prototype against a variety of artificial targets serve to develop and mature sonar and mission algorithms. Technologies come together. The proven rocket propulsion and the dedicated homing sonar are integrated into the SeaSpider prototype. The development of the SeaSpider ATT follows the technological research model. After the initial exploratory development phase a first development and testing campaign focusses on the prototype ATT vehicle’s rocket propulsion, guidance and stabilisation and ensured beneficial self-noise characteristics. The ATT sonar is developed in parallel and undergoes static tests. Torpedo defence is a fundamental requirement of the German Navy. Decades of exploratory research and doctrinal study lead to the result that only a “hardkill” defence system promises sufficient performance. After exploration of other hardkill alternatives only the ATT with its homing capability is considered a valid concept covering all threat scenarios.